So, you want to start your own Nihon Goshin Aikido Dojo. I like it! But before you launch into the wild blue yonder, here are some important Dos and Don’ts. Do: Position your dojo at least 15 miles from all existing Nihon Goshin Aikido dojos *unless you live in places where 15 miles is a really long way due to traffic, etc. * Case in point, my aunt’s apartment in midtown Manhattan is a scant 9 miles from the Nutley, NJ Dojo. That said, if you want to attend a 7:00 pm class in Nutley, NJ ~ you need to leave at least an hour and a half before the class starts ~ due to heavy rush hour traffic. Further, the original Guttenberg Dojo is only about 3 miles away from my aunt’s apartment (just on the other side of the Hudson river), and would still take an hour or more to get to due to rush hour traffic in the Hudson tunnel. Even in less population dense areas, it might make sense to locate a new dojo closer than 15 miles from each other. In Lexington, SC (never to be confused as a metropolis), we lost regular, dedicated students when we moved the dojo just 5 miles down the road. Do: Continue to train with your Sensei. General high school prom rules still stand: “You’ve gotta dance with what brung you.” Furthermore, while your aikido skills may be up to par, I’m sure your Sensei has a whole lot he can still teach you about running a dojo, teaching aikido to new students, etc..
Do: Conduct joint seminars (this could be a great time for testing and promotions, and building a synthesis between local dojo students). Do: Invite your Sensei to teach classes at your dojo from time to time. He may not accept, but you should ask. Do: Ask your Sensei for advice and council all along the way. He may be able to help you out with leasing terms, marketing plans, contacts for website design & storefront signage. He may also know outlets for quality mats, and be able to assist in dojo layout, etc. Do: Submit to a background check & drug test if your Association requests it. As a Sensei, you should be able and willing to stand the basic scrutiny of a background check and drug test as a dojo operator. Just as important as your technical ability, your professional demeanor and character are essential at this point. Of course, character, has always counted, but as a Sensei, your character is subject to maximum scrutiny. Do NOT: Leave on adverse terms with your Sensei. Never burn bridges. Do NOT: Troll your Sensei’s dojo for new students at your dojo. If some students come because it is closer for them, “okay” but do not actively recruit others. Do NOT: Set up a dojo around the corner from the current dojo. Do I need to say “Rivalry within the art itself is unhealthy?” If this describes your current situation and you are the new dojo, plan on relocating when your current lease expires. Do NOT: Change the uniform. 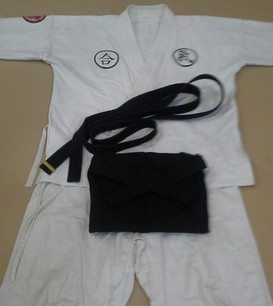 Part of what makes Nihon Goshin Aikido identifiable is the “consistent and identifiable uniform” worn by its members. If you want to design a dojo patch to put on the sleeve opposite your association patch, that is probably fine (Check with your Association or Sensei), but by all means ~ Keep the Ai and Ki patches on a white gi, and black hakama. It is your visible link to Master Morita. Do NOT: Teach a different version of the Classical Technique that you were taught. Changing Classical Technique is ill advised because it waters down our core promise of the inherent authenticity of the art, and it eliminates the standardization templates so hardly fought for in Nihon Goshin Aikido teaching models. If you want to teach the Arm Bar from a straight grab instead of a cross grab (and there is merit to that instinct) that’s fine. You can do it. All you have to do is explain to your students that it is an “Application of the Classical Arm Bar.” In this fashion you preserve the art’s Classical Technique while entertaining your imagination in the process. Do NOT: Throw out Classical Techniques you do not like, and replace them with unofficial techniques you prefer instead. 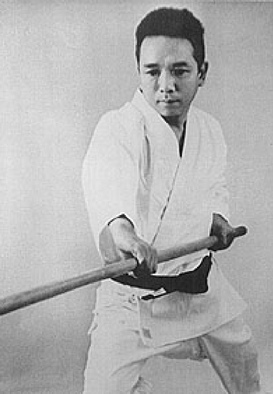 Remember that Shodo Morita included the 50 Classical Techniques he did because he did not believe that all techniques worked well for all people in all circumstances (especially as it relates to ‘body type’ differences between uke and nage). If you don’t like Arm Over the Shoulder, that doesn’t mean that your students will not like it. Consider Sensei Carter’s wisdom on this subject: “My job is to teach all 50 Classical Techniques as if each one of them is my favorite technique, and perform every technique in the same fashion.” If you toss out techniques you don’t like, and add ones you do like, and generations of future teachers do the same thing, Shodo Morita’s idea of Aikido will be irrevocably lost to the ages in a few short generations. Do NOT: Plan on making a million dollars running a dojo. Ideally if you can run your own dojo for less money than you were paying for monthly dues at your former dojo, you’re ahead of the game. grow our art by starting your own dojo. The Classic Lines of the Nihon Goshin Aikido training gi are unmistakable. Association patch on the right shoulder. Some things simply never change. The student/ instructor uniform is one of those things. It marks a connection all the way back to the Chitose dojo, and should be preserved.